Impeachment seems now the word of the day. Impeachment for what, we could surely say. Impeachment for now giving all a fair play? Impeachment for now being on the right track? Impeachment for now having our liberty back? Impeachment for now surviving evil's attack? Impeachment for now being all equally made? Impeachment for now all enjoying a nice trade? Impeachment for now all being rightfully paid? Impeachment for now having a religious right? Impeachment for now having a spiritual insight? Impeachment for now not having to always fight? Impeachment for now giving a Christmas greeting? Impeachment for now blessing what we are eating? Impeachment for now praying at a public meeting? Impeachment for now protecting the family hone ? Impeachment for now letting the love ones roam ? Impeachment for now catching those that moan ? Impeachment for now speaking our frame of mind ? Impeachment for now chatting with the social blind ? Impeachment for now speaking of His holy divine ? Impeachment for teaching our young ones right? Impeachment for keeping them all in our sight? Impeachment for their prayers given at night? Impeachment for now not needing to have a fret? Impeachment for now having a lower tax debt? Impeachment for now not having to starve as yet? Impeachment for now showing power over seas? Impeachment for now not talking on our knees? Impeachment for now not having to say please? Impeachment for now not causing a big drag? Impeachment for now not letting our liberty sag? Impeachment for now standing for our great flag? Impeachment for now knowing right from wrong? Impeachment for now standing for our great song? Impeachment for now being where we all belong? Impeachment, where on earth did it all begin? Could it have started with a nation taken in sin? When the teacher ask the class what impeachment meant, the small child simple responded, " to put someone in a big peach" . Oh for a spark of that simple childhood faith. I remember when just a mere lad, if I didn't get my way at play, I would just pack up my toys and head home. This was what was referred to as a childish temper tantrum, a childish outburst or fit of temper for not getting my way. Now I ask you, has America not grown out of the childhood stage? Seems as if a certain segment of our population has regressed back into that of a childhood temper tantrum by using such a word as "impeachment." insight? For regaining a lost peace of mind? My search of the Internet gave a wide generic definition of this improperly used phrase of impeachment. The various explanations, for this word do not seem to fit what is being advertised in the various social circles. And most importantly, my search of the Holy Scriptures does not mention this word "Impeachment" at all. So why all the fuss? And what's the answer to all this unholy social gossip? For this answer, we must again revert back to the Holy Scriptures. In (II Timothy 3:16) we are given a basic primary plan of action for our lives, a very profitable plan for teaching, for reproof, for correction and for training in righteousness. And this primary plan is backed up in (II Peter 1:21). So what is Divine Providence's lesson plan for our lives, and for our great country? For starters, we surely should not run head-first into a undeserved plan of impeachment for any of God's elected servants which would possibly bring chaos to our God-given nation, upsetting the eventual plan of God, and surely go against the principles of our Creator. Instead, we should seek God's lesson plan for our lives and our nation as found in (II Chronicles 7:14). This plan has the only requirements for blessing: humility, prayer, devotion, and repentance. In simplicity we, God's people, should humble ourselves, pray, seek His face and turn from our wicked ways. Then God promises to hear our cries, forgive our sins and heal our land. Please notice here, this Scriptural responsibility of saving our land is only given to God's people, Christians, and not the evil or ungodly. However, it is Scripture's plan that we, His people, should be witnesses for His plan. (Matthew 28:19-20) (Acts 1:8), that we should help change the land by helping to change its people. So are you counted among His people? And if so, are you talking impeachment, or are you spending the much-needed time in prayer for our nation and its leaders? I realize that we have seen an uptick in cynicism among the populace. Many people do not think very highly of politics, of politicians or of government. 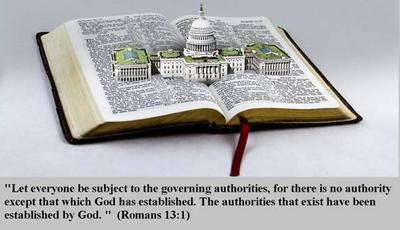 However, Scripture has a plan of action for our government found in (Romans 13:1-7) and again impeachment is not mentioned. May I emphasize again, impeachment is not a solution for eradicating any dedicated public servant. Yes, a new day of national pride is quickly appearing to be just around the corner. And just think how America would stand, if all of us embraced the dictates of our founding fathers, rather than spending so much time, money and energy fighting against America's founding principles. Just my opinion! We should be much in prayer for our great nation, the United States. In doing so, we should pray for more Gospel-focused politicians who will seek to serve the Gospel's interest with integrity from within our national, state, and local governments. And we must engage in self-examination, prayer, and devotion to God's Holy Word. Amen !